Heat the oil in a pan. Add slit green chilies, bitter gourd pieces and turmeric powder into it. Saute for a while. Cover the pan with lid and cook the bitter gourd in low flame. Keep it aside. In another non stick pan, add the grated coconut into it.Dry roast the coconut till it is brown in color. Add fenugreek seeds, coriander powder and red chili powder into it and roast for a while. In a mixer grinder, make a very smooth paste of the roasted ingredients. In pan heat the oil hand add mustard seeds into it and allow it to pop. Add dry Red Chilies shallots and curry leaves into it saute for a while . Mix salt tamarind paste, salt, coconut paste and one cup of water into the pan and mix properly. Cook the mixture for around 5 to 7 minutes or till the gravy thickens. 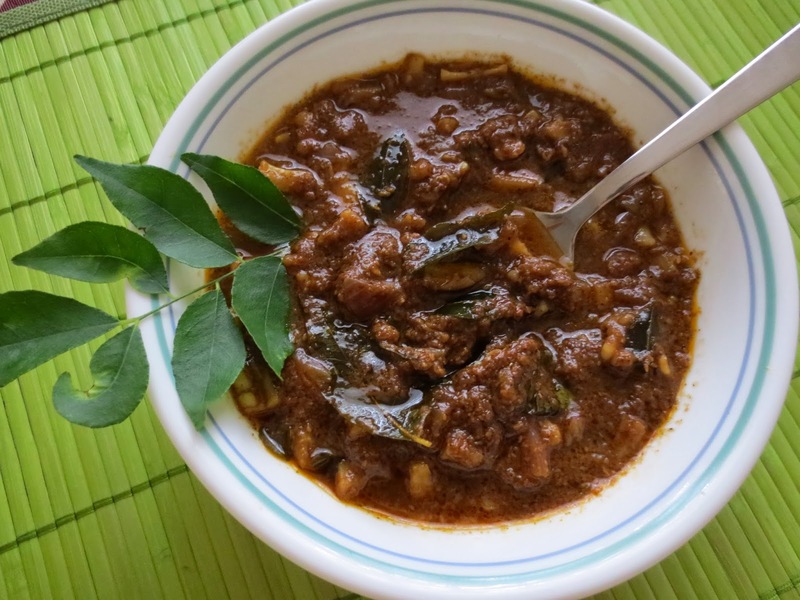 Pavakka theeyal is ready and can be best served with hot steamed rice.